No matter where you are in the world, whether you are out and about, at work, or home, you should always have access to the most important wound care supplies. Even having the very basic medical kit can in certain situations save someone’s life. The fact that putting together such supplies does not cost that much means that there is no excuse not to have them. If you work for a company that does not even have a basic first aid kit, then you need to speak with the manager; such things are now law in many countries. All of the supplies for a first aid kit to deal with wounds are available from most supermarkets, there is no need to use a specialized store. Some kits will need to be industry specific, for instance, anyone who is working with acid needs to have a lot of sterilized water at hand, while those working with blades will need a lot of bandages. You can buy off the shelf kits for wounds, but it is much better to put them together yourself, that way you know exactly what is in it, and that it has everything required for the environment that it will be in. 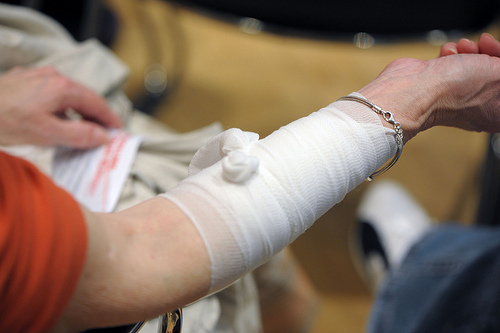 So what are the most important wound care supplies? A roll of medical adhesive tape. Various bandages of different length, thickness and width. Both in rolls and strips. Cotton buds and cotton balls. Triangular bandage. This is for supporting an arm. Aspirin. This is for people who may have suffered a heart attack. Paracetamol. This one should be used for pain killing. All of these should be kept in an airtight container so that they never get wet. Some items have an expiry on them and must be checked, and replaced if necessary, every few months. The kit also needs to be checked monthly to make sure that everything that is supposed to be there is present. If anything gets used, it needs to be replaced instantly. Although having wound care supplies at hand is a good thing, they are not always that much use if you do not know what to do with them. These days there are plenty of first aid courses around, and just spending a couple of hours doing one can teach you enough to save someone else’s life, and maybe even your own one day. Some countries not only have laws in place to ensure that first aid kits are required within industry, they will also will fine anyone who is found not to have one in their vehicle. One of the countries with such a law is Germany, which is why you will always find a first aid kit in a hire car. By ensuring that medical supplies are present no matter what you are doing, or where you are, you are not only ensuring your own safety, but that of others. The fact that the most basic of kits only cost a few dollars, means that there really is no excuse not to have one. Jerry Lee has been working in medical supply industry for more than five years. He loves to write about the medical supply industry for different blogs. He is currently working for EMedItems in City of Industry, CA.